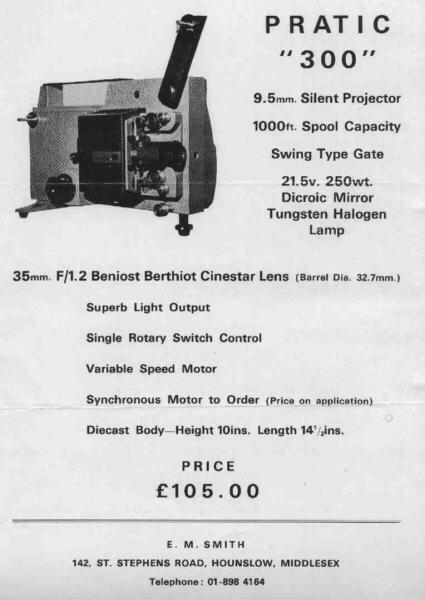 At the time of writing I must admit that I know very little about this French company, except that I have a couple of 9.5mm cine projectors in my collection, made or converted by them sometime in the late 1960s and early 1970s. 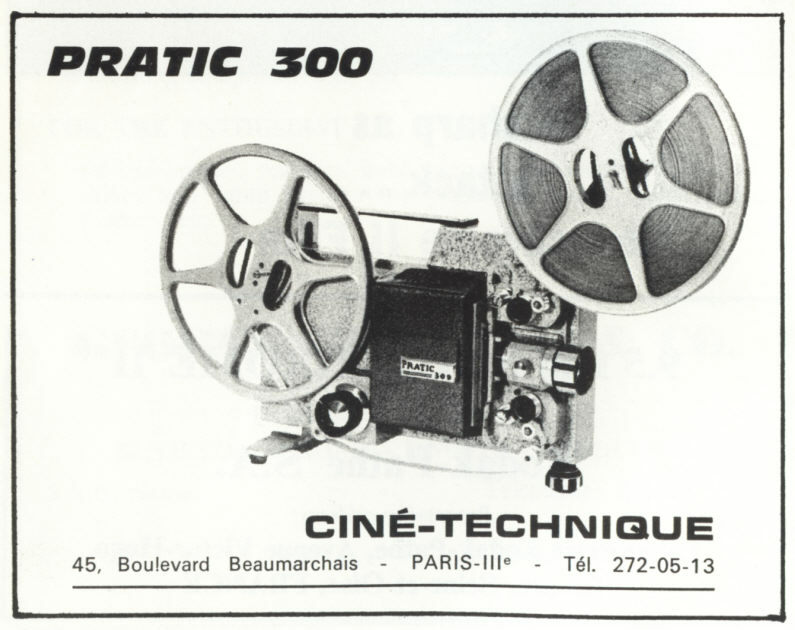 My limited information tells us that Cine-Technique was a French cine company, based at 45 Boulevard Beamarchais, Paris, France and owned by Rene Llorens, an ex-Pathé cine engineer. 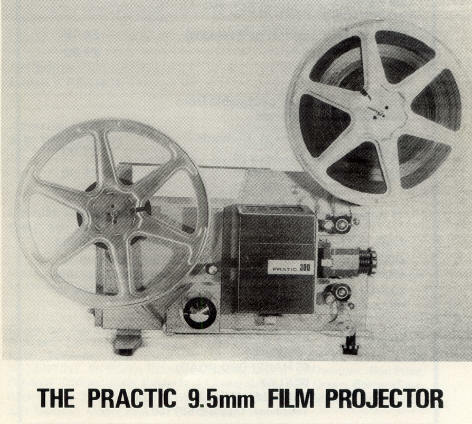 The Cine-Technique cine projectors were imported and distributed in the UK by Ted Smith, one of the stalwarts who helped to keep the 9.5mm home movie film gauge afloat once the UK Pathéscope company had dropped 9.5mm cine products. 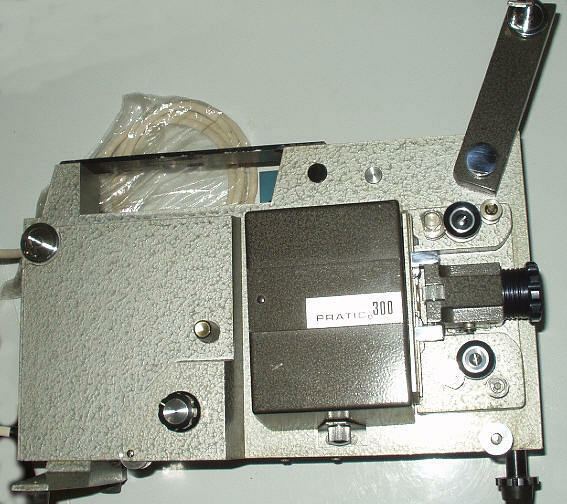 PRATIC 300 SILENT 9.5MM CINE PROJECTOR. 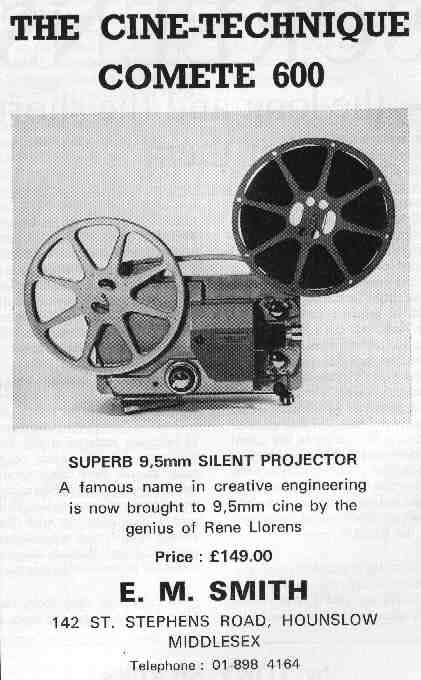 Their first projector was a silent machine built to quite a high specification. Known as the "Pratic 300" (not "Practic" as on the photo above!) it has a heavy solid 10 inch high by 14.5 inch long body casting which contains a series wound variable speed motor and decent size mains transformer supplying the tru-focus 4-pin Q17 valve base 21.5 volt 250 watt DKM lamp (incidentally for shows where less light is needed the A1/194 21.5 volt 150 watt valve base reflector lamp also fits). 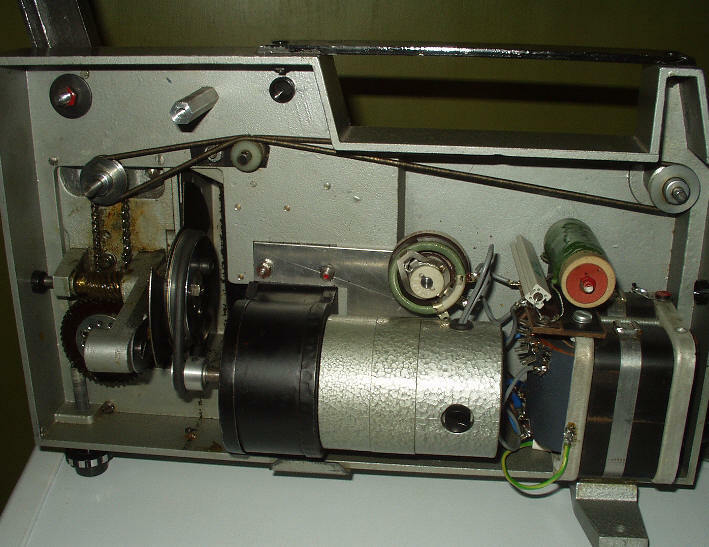 The machine takes up to 1000 foot (300 metre) spools, and although there isn't reverse run or power rewind, films can be rewound quite quickly swopping the full spool to the feed arm and putting the empty spool on the take-up and running the machine normally. The lens barrel is the European 'standard' 32.7mm diameter and normally fitted with a 35mm f1.2 Berthiot Beniost coated lens. Framing is provided by an edge screw on the side of the lens hinge / swivel which moves the lens assembly up and down a little. A steel strap across the top of the casting provides a decent carry handle. My own machine (still can't find a serial number) gives a lovely bright, sharp picture (with a measured 235 volts mains voltage input, the lamp on-load voltage is exactly 21.5 volts). The motor however would run a little fast in the UK (French mains voltage was 220 volts in the 1960s/1970s), so most UK models are fitted with a decent size 220 ohm (Radio Spares - did I fit this myself??) resistor in the motor circuit, then giving a range of speeds from approximately 16 to 24 fps (frames/second). A motor suppresssor capacitor might.be a good idea! My machine has a smaller rotary motor/lamp switch knob than that shown in the illustrations above. Maybe a different batch or a later replacement. The innards reveal the simple design with decent size lamp transformer and series wound motor. The main shaft finishes just inside the main body (photo lhs) with a plastic sleeved hole for an inching knob or tape synchronising connection to be fitted. 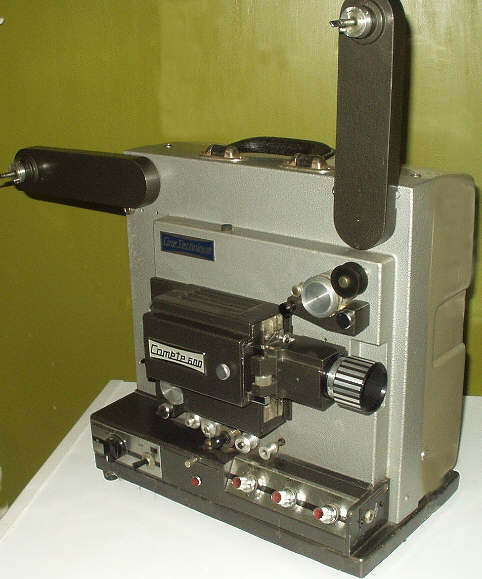 The rubber drive belt is virtually the same size as that on the Ligonie Super Europ 9.5mm projector. One can see the large green dropper resistor in the motor circuit (is the motor 110 volt?) with the white (Radio Spares) extra 220 ohm (just to the left of the green one) added for the UK. 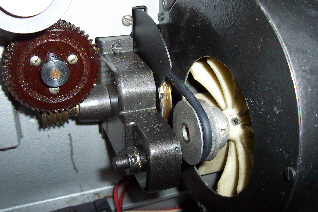 The variable motor speed rheostat is seen just above the motor. (I have just fitted that motor interference suppressor capacitor!). Motor brushes are 5mm square. A single (screw adjustable) front foot is visible on the bottom lhs. All is safely electrically earthed via the three core mains cable. 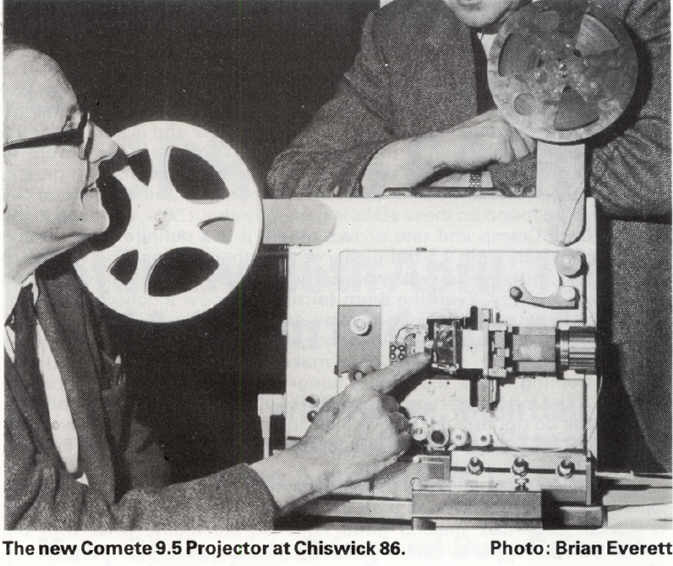 Probably the next machine was the 9.5mm "Comete 600" silent projector. My notes suggest that this dates from 1970 but I currently have little more information except that it had a 24 volt 250 watt projection lamp and took spools up to 2000ft. Looking at the photo above, the mechanism layout seems similar to the Pratic 300, but with a larger lamphouse and restyled carring handle along the top of the body casting. 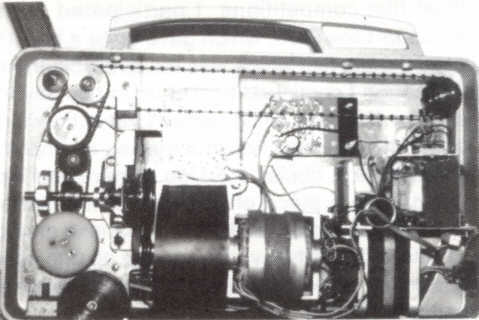 Above is a photo of the inside of a Comete 600, courtesy of the late Jan Brezinka and the Group 9.5 magazine. Ignore the circuit board top centre, the smaller transformer fitted at the centre on the right hand side and the flywheel at the bottom left hand side. 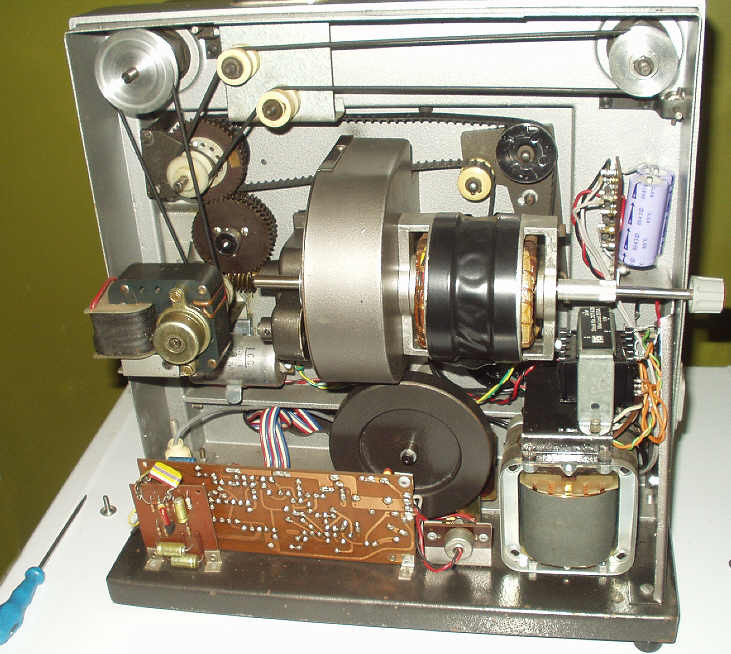 (these were later UK additions to convert the machine to optical sound) The main mechanism is very similar to the earlier Pratic 300 shown at the top of this page, but with a synchronous type motor and drive fitted to the front (feed) spool arm for (I guess) reverse and power rewind. Anyone with more information please!! Photos from a French cine web-site - beaucitron.com - merci mon ami! Finally I have another machine in my collection - a Cine-Technique "Comete 600 Sound" - same name as the two above, but somewhat different design to the first model 600 listed! Originally mentioned in Ken Wordsworth's column in the UK Group 9.5 magazine Number 25 dated Summer 1980 as a prototype, it is again mentioned in the UK Group 9.5 magazine Number 48, dated Winter 1986/97. It was shown at the 1986 Autumn Chiswick Group 9.5 Get-Together by enthusiastic 9.5mm dealer Ted Smith. Models were offered in 9.5mm silent at £445; 9.5mm optical sound and 9.5mm optical/magnetic sound - prices for these are not mentioned! The talkie model appears to really be a 16mm design but modified to 9.5mm. 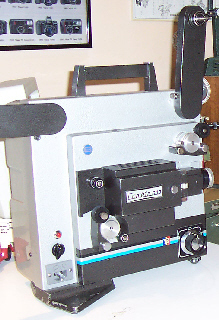 Obviously still manufactured by Cine-Technique - spot the same lens holder and framing adjustment, but a much larger (14 inches wide, 9 inches deep and 14.5 inches high, with the spool arms folded) and heavier body. The spool arms take up to 2000ft spools with much larger feed and take-up sprockets and a nice long film gate. The lens mount is 42.5mm inside diameter and on my example, is fitted with a 35mm f.1.5 Roussel, Paris lens. (It is useful to know that lenses for the Elf/Eiki machines will just fit in this mount). It is fitted with a 24 volt 250 watt ELC or A1/259 QI reflector lamp giving a nice bright picture. (With a measured 236 AC mains voltage input, the lamp on-load voltage is 24.4 volts - the mains input is obviously really designed for the French AC mains of 220 volts) A decent size induction type motor drives the machine via a rubber belt and pulley at a single speed of 24 frames/second. Maybe it was intended to fit a double pulley for 18/24 fps at a later date? My machine may have had the exciter lamp modified later in the UK - the lamp, a 6 volt 1 amp type, is supplied by a UK Radiospares 230/12 volt transformer via a panel with full wave diode pack rectification, dropper resistors & capacitor smoothing, supplying about 5 volts DC to the exciter lamp. The actual lamp has been partly painted with matt black, presumably to avoid stray light leakage onto the photo diode. 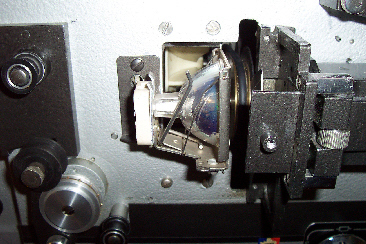 The actual position of the exciter lamp is quite critical - there are black plastic topped nuts under the projector which allow for adjustment. Sound output is via a standard 1/4 inch jack socket and is intended for use with an 8 ohm loudspeaker. The transistorised amplifier has controls for volume, bass (graves) and treble (aiques). The main rotary switch has positions for "off" /" motor" /" motor & lamp" /" motor & lamp & exciter lamp". There is a separate amplifier on/off switch, plus a switch marked opt/mag, but the magnetic position has a black sticker over the mark. (Intended for the mag/optical model). 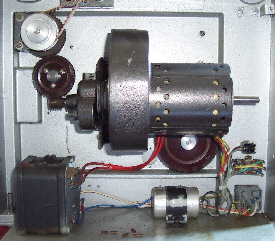 The inside of my 9.5mm Cine-Technique Comete 600 optical sound projector. Again no serial number visible. On the left hand side the separate rewind motor can be seen - a simple induction motor which just drives the feed arm when power rewinding. There are a number of belts including one long toothed type which drives the take-up sprocket. 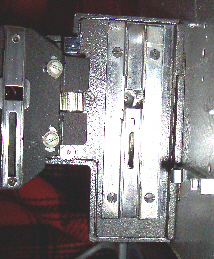 The take-up drive relies on the main internal take-up drive belt to slip a little. Currently this is a rubber belt; the tension is quite critical so as to provide the correct take-up tension - I wonder if this really should be a metal spring belt? The extra Radio Spares transformer and power pack board above on the right hand side is probably a UK modification on this machine which also has a Euro mains input socket fitted - looks a bit like the late Jan Brezinka's work! Maybe the original exciter lamp was a weird type with spares unobtainable..
Again any extra information would be appreciated!